The WTO Public Forum is taking place from 2-4 October. The programme is here. 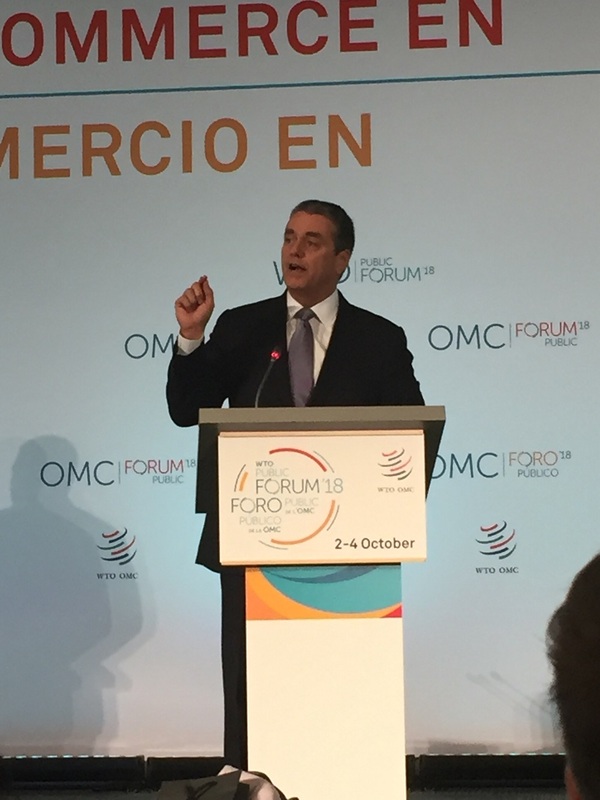 According to WTO Director-General Roberto Azevêdo, the public forum is growing in attractiveness. This year, he said, the forum is “bigger than ever.” Since its creation in 2012, sessions and attendance have more than doubled, he said, with over 2,500 attendees this year and 112 events. “We are out of rooms,” he said, explaining that over 200 applications were received. But if rooms cannot be added, time can, he said, adding that the WTO is considering extending the duration of the forum to four days for next year, instead of the traditional three days. The interest in the Public Forum means “we are on the right track,” and “raising the right issues,” he said. According to the WTO, the joint publication “details how governments can work together to ensure that trade and a healthy environment reinforce each other. It makes the case that opening up trade in environmental goods and services is a triple win for the economy, the environment and development.” The partnership between the two bodies was announced in January 2018. Technological Evolution Cannot Stop, Shape It! The world is changing at an unprecedented rate, he said, new technologies are emerging, environmental risks are growing and “this is challenging the way that we think about trade.” If the proper synergies are in place, in particular regarding public policies, he said, by 2030, the technological revolution with help to fuel additional trade, he said. “I believe that the fundamental principles apply, and they are enshrined in the WTO agreements,” he added, but asked, are those basic principles enough? Any constitution, any founding legal text, if not regularly updated, will grow gaps between those basic principles and the evolution of habits, behaviours and ethical values. More often than not the courts step up to fill those gaps, with jurisprudence for example, he said. Technological evolution and new technologies cannot be stopped, he noted, but they can be shaped. “If we do not [shape them], it is inevitable that many will be left behind,” that might create new social problems, unease and unrest, he said. Citing a report by the World Economic Forum, Azevêdo said that by 2025, for the first time, machines will perform more work tasks than humans. The report found that technology could wipe out 75 million jobs over the next four years, however the report also found that technology could create 133 million new jobs. “We cannot put progress on hold until we are ready,” he said, “we have to start talking now and get involved and that is what we will be debating” at the public forum. The vision of Jack Ma, executive chairman of China’s Alibaba Group, for trade in 2030 seems simple “let’s stop worrying about the future,” he said, adding that the young generation will find solutions. Some 85 percent of commerce will be ecommerce in 2030, according to Ma, adding that only 1 percent of trade will remain offline. In 2030, it will not be a matter of a good being made in China or Switzerland, but it will be made in the internet, he said. Trade in 2030 will belong to small businesses, he said, because they are flexible. But they will need to go global. “If you are not globalised, you are dead,” he said. Ma pictured a world where manufacturing will be left to artificial intelligence and robots, and where services will be job creators. Erik Solheim, executive director of UN Environment, and UN under-secretary-general, was resolutely optimistic during the opening plenary discussion. In the last 15 years, global poverty has halved, he said, contrary to the popular belief that it has doubled, he said. He also noted the progress in global life expectancy, and a UN Environment report showing there was more new electricity coming into the global grid last year from solar panels than from oil, gas, coal and nuclear combined. That could not have been achieved without trade, he said. According to Solheim, the world is much better off than any other point in the world history, contrary to the view relayed by the media, he said. It is time to start fighting, he said, as the trade and environment communities are under pressure and challenged. “We need to fight back,” he said, calling to fight ignorance with fact. Laura Behrens Wu, young entrepreneur, CEO and co-founder of Shippo, a multi-carrier shipping software for e-commerce businesses, said she created Shippo after noticing the difficulty met by ecommerce businesses had to find suitable shipping methods. Tunde Kehinde, co-founder, Lidya, a company providing small business loans and working capital, said small businesses can obtain financing the same day. Data and technology both work in favour of credit score and access to financing, he said. The system is able to reward good financial behaviour, he said, and can open the world to small businesses. Christine Bliss, president of the US-based Coalition of Services Industries (CSI), underlined the growing importance of services, underlying the majority of all other activities. The evolution of technology led to an increasing integration of manufacturing and services, with the advent of smart technology, the internet of things, and online platforms. In 2015, she said, the volume of data flows exceeded the flow of goods. Behrens Wu said ecommerce allows customers and sellers to establish a personal relationship. Ecommerce companies are selling an identity and a lifestyle beyond their products, she said. According to Ma, there is no need to regulate. Governments want to regulate, he said, noting that the European Union “loves regulation,” and adding, “they worry a lot” but worry is an opportunity for finding solutions. “Leave some time for innovation…. If you start to regulate you kill everything,” he added, alleging that most regulators are not ecommerce users. Internet is not made for rich countries, he said, noting the global use of mobile phones. The technology revolution came from the bottom, not from the top, he added. Government should build infrastructure, not regulate, but promote technology. Solheim agreed and noted “how fast the most marginalised” are picking up new technologies. The first item people are buying is a mobile phone, he said, showing the democratisation of the world. Answering a question about the US-China trade war, Ma said it is easy to launch a war but difficult to stop it. Over the next 30 years, the world is going to face huge challenges brought by the technological revolution, Ma said, and the US and China should work together to address those challenges, to create more jobs, to cure poverty, use technology to cure diseases, instead of going on the commercial war path. Besides US and China, a trade conflict could hurt small businesses in many other countries, he argued, adding that the business community does not like this. 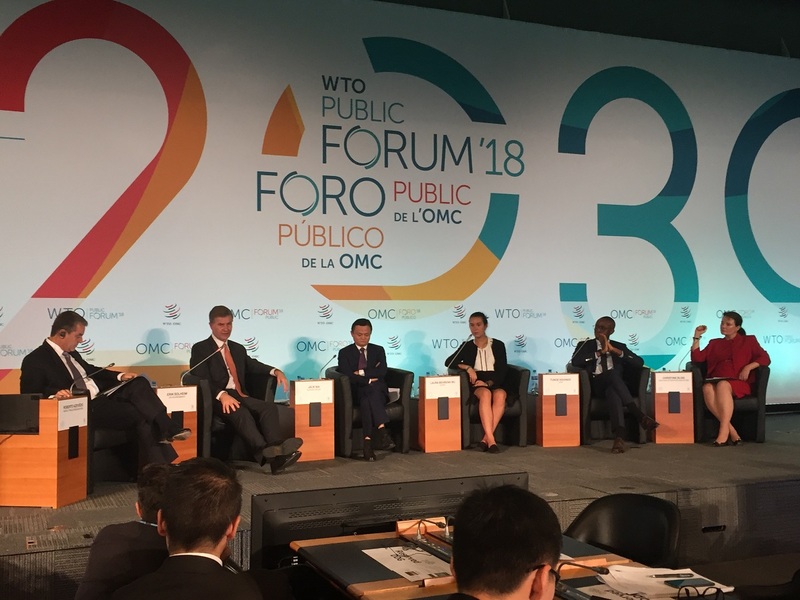 "Trade In 2030: WTO Public Forum Opens With Visions For The Future" by Intellectual Property Watch is licensed under a Creative Commons Attribution-NonCommercial-ShareAlike 4.0 International License.